the joimax® group announces very strong sales figures for 2017. 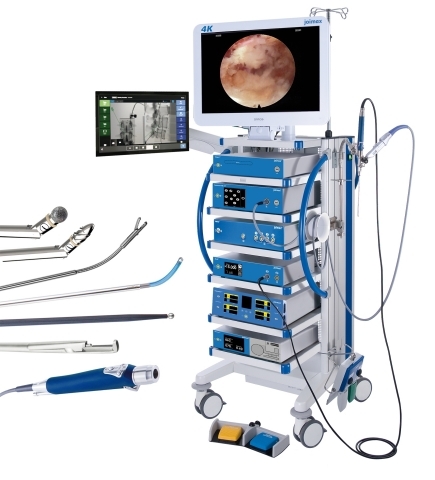 The German based market leader of technologies and training methods for endoscopic minimally invasive spinal surgery shows a jump of almost 80% vs. 2016 in the U.S. Consolidated sales show a growth of nearly 30%, which reflects its CAGR of 35% since 2008. Based on the inclusion of the newly created AMA CPT code 62380 for endoscopic decompression of the lumbar spine as of January 1st, 2017, and the worldwide increasing adoption rate of the joimax® procedures in general, the company is gaining a strong foothold throughout the U.S. The acceptance of endoscopic minimally invasive spine surgery techniques and their benefits to both the patients and the surgeons are steadily growing worldwide. “With this latest approval we now can market all our systems in this important country, which is a great step towards more targeted patient care,” states Wolfgang Ries, Founder and CEO of joimax®. The Endovapor® 2 generates electrical power for monopolar and bipolar cutting and coagulation of tissue structures in surgical operations. The device is an all-in-one generator with specially integrated programs for spinal surgery with interdisciplinary application. It is equipped with two monopolar and two bipolar sockets and easy and intuitive touchpad technology. With arc control for safe application and easy neutral electrode monitoring, it combines a variety of electro-surgical modes and effects.